The NYU Stern Center for Sustainable Business uses its Return on Sustainability Investment (ROSI™) methodology to monetize the benefits of sustainable practices. ROSI™ can be applied to practices throughout an organization that have already been implemented, are currently in development, or for future projects. Sustainability drives business and societal success. The challenge most businesses face is proving the monetary impact of sustainability (ESG). 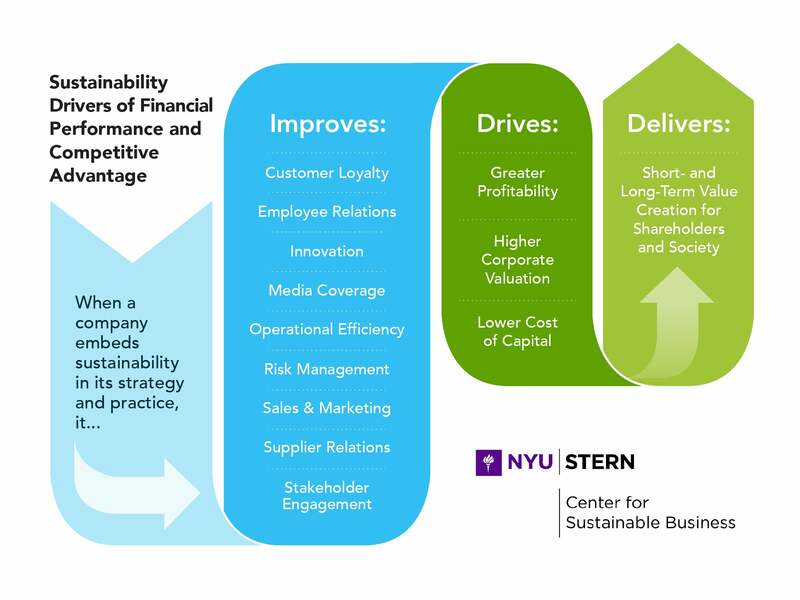 The NYU Stern Center for Sustainable Business believes successful sustainability initiatives are embedded in corporate strategy and tracked through financial metrics. Sustainability-related issues are no longer siloed as special projects or limited to efficiency-related sustainability efforts. Using the ROSI™ methodology, companies can clearly quantify the full range of costs and benefits, including intangibles. ROSI™ enables CFOs and investors to better integrate, measure, and report on corporate financial performance resulting from embedded ESG. The use of our methodology empowers managerial decision-making and investor communications. The first is to identify the material sustainability practices through the lens of the drivers of financial performance (innovation, operational efficiency, supplier loyalty, etc. (see figure below). For example, a specific practice for an auto manufacturer may be to improve waste management. We will review what innovations, operational efficiencies, employee engagement, etc., results from that commitment. Next, we determine the potential financial and societal benefits from these practices, e.g. under operational efficiencies: selling recycled materials, using recovered materials, using recycled water in manufacturing. As a third step, we quantify each benefit, e.g. % of manufacturing waste that is recovered and reused. Lastly, we apply a monetization process to calculate monetary values for the intangible and tangible benefits, e.g. weighted average unit cost of recovered materials vs the cost of reused materials, with the net being the return on investment. The results speak for themselves. We recently applied our ROSI™ methodology to the Brazilian beef industry, the world’s second largest beef producer and consumer. After investigating the financial costs and benefits of the uptake of sustainable and deforestation-free beef by ranchers, slaughterhouses and retailers in Brazil, we found that sustainable and deforestation-free practices have the potential to create significant financial benefits across the entire value chain. While sustainable agricultural practices provided the most financial benefit, deforestation-free commitments reduced risk. Ranchers who invested most in adopting new practices, reaped the greatest benefits by increasing productivity 2.3X and profitability nearly 7X. Cattle raised under a sustainable system command a higher price, they are larger and of higher quality than animals raised using standard practices. These benefits also translate into better cost management, agricultural innovation and increased productivity and quality. Slaughterhouses also significantly benefited. Beef labeled as premium-quality can be priced 20-30% above average quality beef in super-markets. This translates into increased revenues for slaughterhouses that can market higher quality and deforestation-free beef. Our estimates showed reduced reputational, regulatory and supply continuity risks—between $20-120 million (depending on the company) in expected net present value over ten years. For retailers, while the immediate gain was not as substantial, the long-term upside of managing reputational and operational risk through sustainable sourcing is critical for consumer-facing businesses in today’s world where customers can easily, and publicly, hold brands accountable.